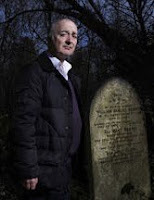 The long-awaited Channel 4 documentary Witches, in the Tony Robinson's Gods and Monsters series, is finally going to be shown on TV on Saturday 17 November at 8pm on More4. "Before he became James I of England, James VI of Scotland nearly died in a terrible storm at sea, which he believed was caused by a spell cast by witches. Tony Robinson follows the story of a Scottish midwife called Agnes Sampson (one of the models for the witches in Shakespeare's Macbeth). Witches like Agnes were believed to be agents of the Devil; their magical powers believed to be gifts of Satan. They could make people sick, make crops fail, or cause misfortunes. They were said to travel on broomsticks, made to fly by the application of a paste made from the crushed bones of dead babies. This sounds extraordinary - almost comical - to us today, but 400 years ago witches were terrifyingly real. Tony investigates the process of arresting and interrogating a suspected witch; and discovers how red-hot tongs, thumbscrews, sleep deprivation and stress-positions were all used to extract confessions. In Agnes Sampson's case, this process was overseen by King James VI himself. And he did a good job: Agnes confessed, and was convicted and burned to death." The final episode in the Gods and Monsters series - Gods - will be shown on Saturday 24 November at 8pm on More4.